I'll be back when Mr. Linky shows up! I like the photo--great smile, Vinny! Age means nothing in a lovely relationship - annually, we redefine the term 'old' - only a state of mind! A genuine smile, a wonderful cake on a day where more memories are yet to be made. Congratulations! Vinny looks so happy! happy birthday ,Vinny! 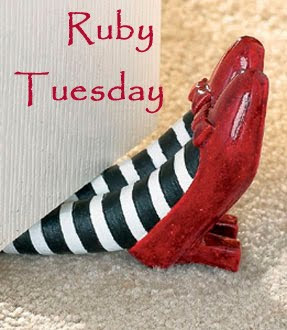 I'll be back for the link but my ruby tuesday is here. That's the smile from the birthday boy!! Happy Birthday Vinny!! Happy birthday and happy RT! The cake looks delicious! Happy Birthday. Thanks for hosting. I'm glad to be back after sometime. A Happy Birthday to Vinny! Hope one of those tickets paid off! Happy Birthday Vinny and happy RT to all! Happy B'day and Happy RT !! Happy Birthday, Vinny, from Bob and I.
O what a happy birthday smile! And the cake looks wonderful! A cheerful birthday party!! Great portrait of a happy occasion. Lovely photo and such a good looking cake! Thats a genuine smile!! Happy ruby tuesday. Happy birthday Vinnie. Such a great charming smile must melt any ice cake in your surroundings. Hope some of those lottery tickets went in. Great smile and love the cake, Vinny! Enjoy! Happy Birthday to Vinnie. He has a lot of lottery tickes from the looks of it. Hope he got lucky. Happy Ruby Tuesday! That's a nice red tray but I bet the cake was delicious ! What a sweet, sweet photo. Happy Birthday, Vinny! That cute cake looks so good, and of course the tray is the right color! Fun to join in the RUBY Tuesday fun! That's the spirit of life! Nice things under the bed...on the bed...Is that why Vinny is smiling? Happy birthday, Vinni...may the year ahead be a wonderful one for you!